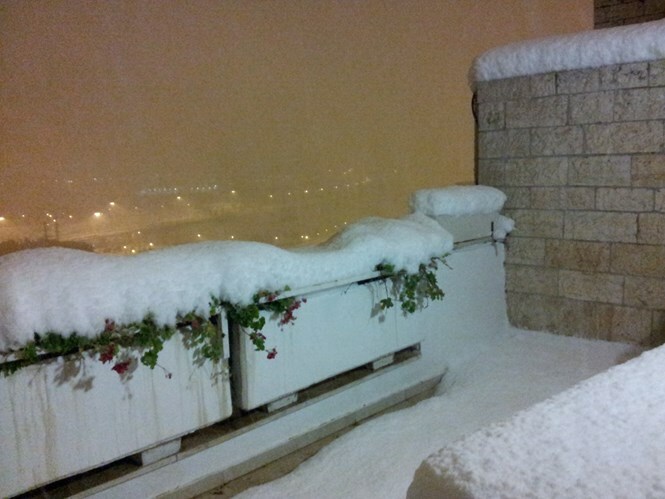 Power outages throughout Israel in storm of 'rare ferocity, thousands of stranded drivers rescued by IDF and police. 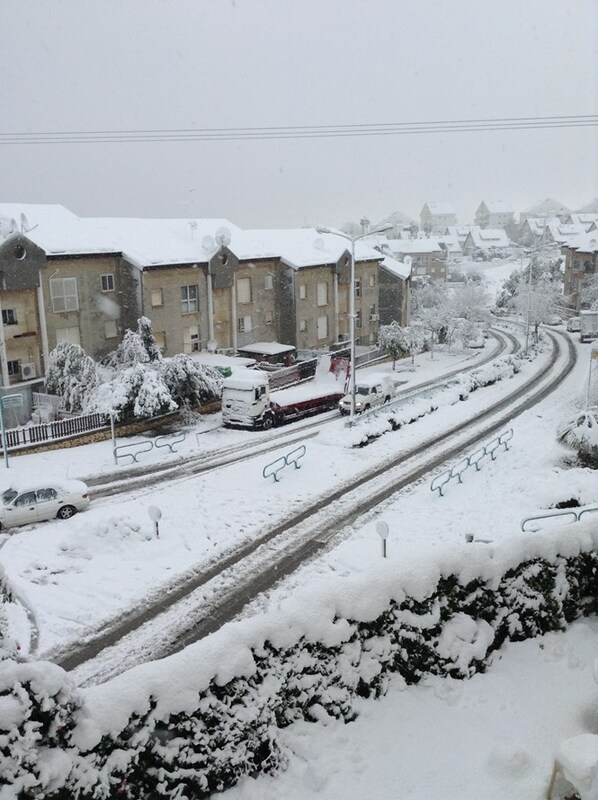 Snow continues to fall across Israel Friday morning, reaching new regions of the country and causing major power outages and road closures. Jerusalem Mayor Nir Barkat released a statement saying "we are battling a storm of rare ferocity." The capital has over 37 centimeters (15 inches) of snow, with deeper snowfall in other areas. 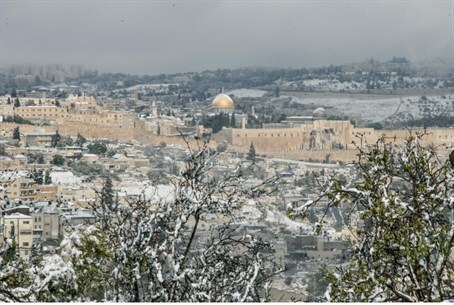 A weather forecaster on public radio described the storm as "historic," as Jerusalem temperatures already dropped to 2 degrees celsius (35.6 Fahrenheit), and are expected to drop below freezing. Snow is anticipated to continue falling through Saturday. 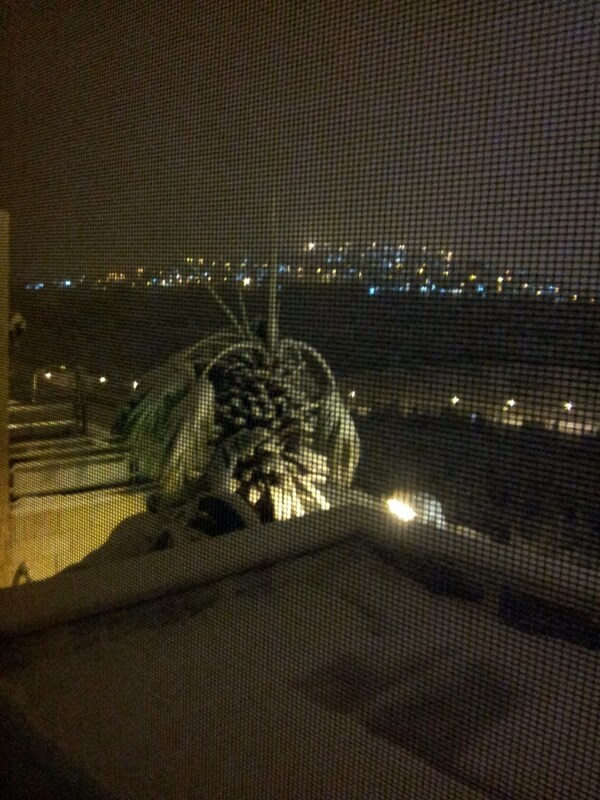 The views in Jerusalem are spectacular, as the hills of the city turn white and the rooftops in older neighborhoods wear a white contrast to the Jerusalem stone. A power outage has affected more than half of Jerusalem, although some areas are reporting a return of electricity. 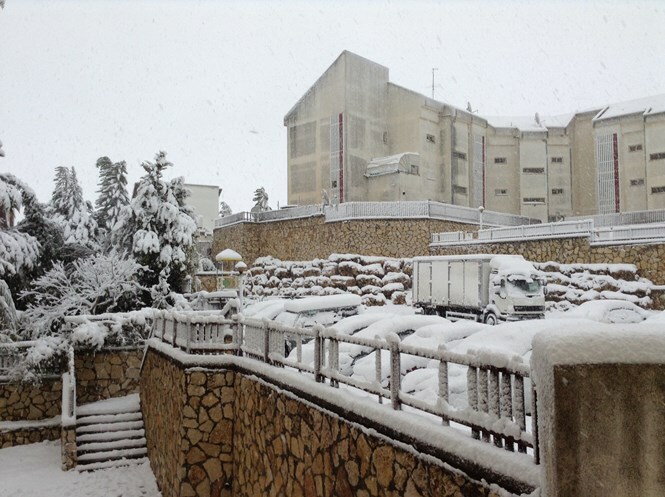 In Kiryat Moshe, Merkaz Harav Yeshiva opened its dormitory and dining room to stranded families who reached the entrance of the city, where the yeshiva is located, but could not get to their destination. Many more drivers were stuck on the roads in the city overnight, without food and water, after attempting to reach the city to see the snow. The Jerusalem municipality is continuing with the rescue operations that began Thursday night and have so far saved over 2,000 people. The IDF and the Border Police are assisting in the operation. Drivers who have been rescued have been taken to the Binyanei HaUma (International Convention Center), a community center in Mevaseret Zion and the Ofer Camp on Highway 443. 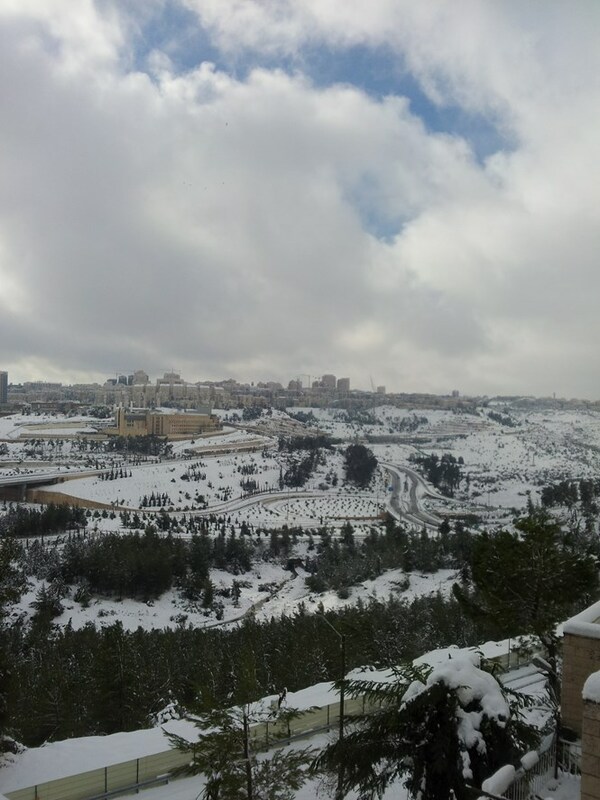 The Israeli police have released a particularly strong warning to drivers in affected areas against going out in blizzard conditions. Police have warned residents across the country to avoid leaving their homes for any reason during the snowfall. 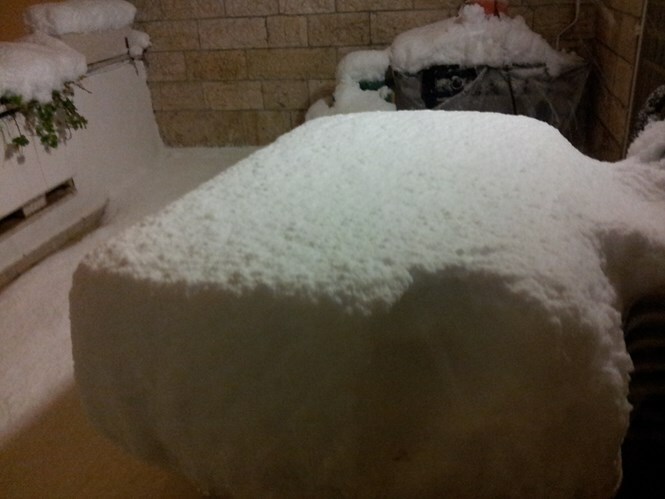 Judea and Central Samaria villages are also receiving more snow - some for the first time in over ten years - including in Ariel, Nofim, Yakir, and Barkan. 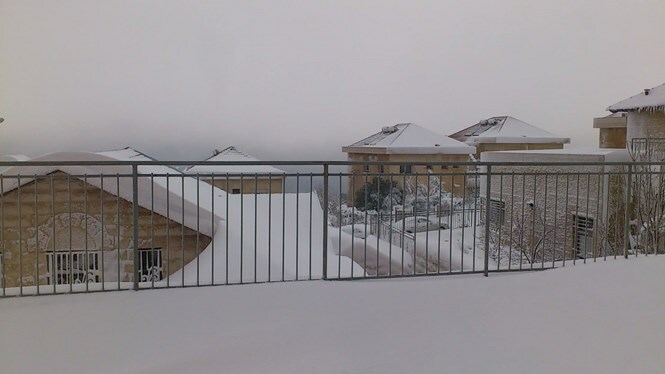 In light of the situation, schools are closed in the following places: Yakir, Ariel, Barkan, Revava, Tapuah, Alei Zahav, Peduel, Rehalim, Nofei Nehemia, Bruhin, Kiryat Netafim, Yitzhar, Har Braha, Itamar, Alon Moreh, and Karnei Shomron. 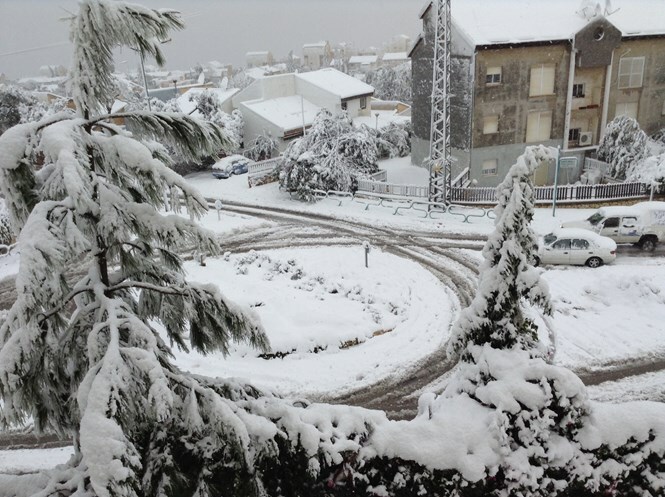 Power outages have been reported across the central Samaria area; all roads are closed. The Shomron Regional Council is working to help Judea and Samaria residents and to provide aid. Lightning can be visible Friday morning near the Ariel area. Residents have been warned to stay indoors. Unconfirmed reports are also coming in that at least 80 people are stranded in a photography studio in Neve Ilan.